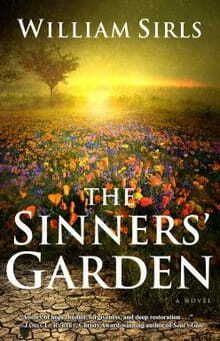 There’s a thread of magical realism coursing through William Sirls’ latest novel, The Sinners’ Garden. Or, if not full-fledged magical realism, at least events which involve the invasion of the spiritual world into the physical. Through a story that involves supernatural occurrences in an ordinary Midwestern town, Sirls explores miracles and the effect they might have in the modern world, especially as a catalyst for reconciliation and healing. Set in the Lake Erie community of Benning, the story follows a small group of family and friends working to come to terms with lives gone off track. There isn’t one central character, but rather a cast whose journeys represent everyday folks in various stages of belief or unbelief in the Gospel. Both Judi Kemp and her 14-year old son have struggled to cope after a tragedy 11 years earlier left Andy physically scarred and without a father, and left his mother unable to trust or heal psychologically. Her brother, Uncle Rip, has recently re-entered the family’s lives after a stint in prison selling marijuana. Their lives intersect with Heather Gerisch, a town police officer investigating a bizarre series of break-ins conducted by a prowler dubbed the “Summer Santa” by the media because he has a knack for leaving cash or gifts which deal specifically with the problems facing the person whose house he invades. Meanwhile, another unexplained phenomenon occurs at the edge of a local canal, where a field next to a deserted factory suddenly blooms with a huge patch of wildflowers. To the main characters, the field of flowers has a sudden spiritual effect on anyone observing them, lifting their spirits and putting them in touch with God, or something Other. Also, Andy Kemp is hearing voices through his iPod, leading him to bring prophetic messages to several people in the town. While there is some suspense involved in getting to the source of these occurrences, Garden is less a mystery than a drama. The strange occurrences serve to provide tension and pique curiosity, but Sirls is most interested in the human relationships and the spiritual lives of the characters. A former businessman who came to the Christian faith during his own time in prison for money laundering, Sirls clearly has a soft spot for the lives of broken people. He strives to imbue each of the main characters with a fragility and humanity, and their struggles and journeys are compelling. It’s to Sirls’ credit that he stuck with the narrative and followed each character’s journey through to the end. While the novel is rather slowly paced – over 350 pages in length – readers will find a comfort and warmth in the pages, not a sermon, but a story. In this way, Garden is a good argument for the Christian publishing industry. Here is an authentic depiction of the day-to-day struggles of real people wrestling with questions of faith, but which might never see the light of day if not for a Christian publisher. While mainstream secular publishers shy away from books which deal with issues of sincere, earnest Christian spirituality, a book like this one has the ability to speak to readers who are themselves grappling with the central question – what of someone who wants to believe God loves them, but must overcome personal guilt and doubt first? It’s not the most glamorous story, but in its own quiet way, the book is able to make its point.